We have had some crazy weather here in the Midwest this spring: many days of rain, cooler-than-normal temps, and gusty winds. 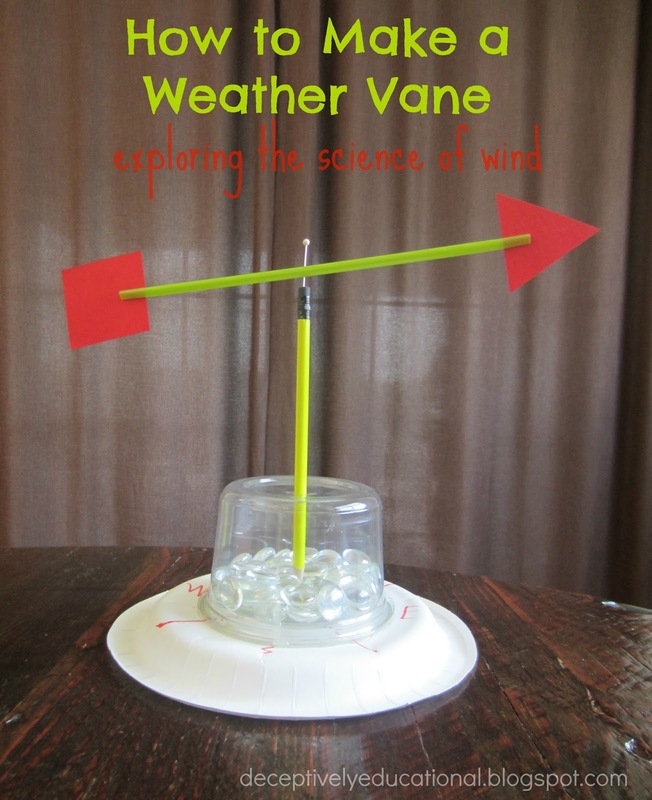 This activity was perfect for those blustery days. Making a weather vane is a simple project; gathering supplies is the hardest part. Draw two perpendicular lines on the bottom of the plate that intersect in its middle. I cut an extra plate in half to use as a template. Cut a small x shape in the middle of the bottom of your plastic food container using a craft knife (parents only). This will need to be big enough for a pencil to squeeze through, but small enough to hold it tightly in place. Place the container, lid-side down in the middle of the upside down plate and trace around it. In the four quadrants, write N, E, S, W for the cardinal directions, making sure to put them in the correct order. Add rocks or glass baubles to the container as weight. Add hot glue (parents only!) to the lid and secure it to center of the plate, using your traced line as a guide. 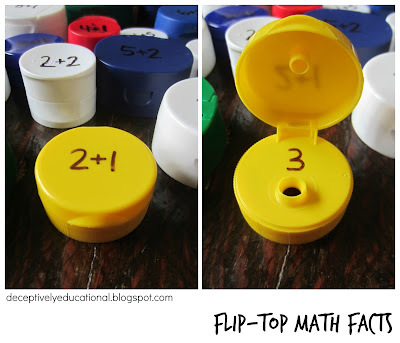 Shove the sharpened pencil (lead first) into the center of the plastic container. Make sure it is straight. 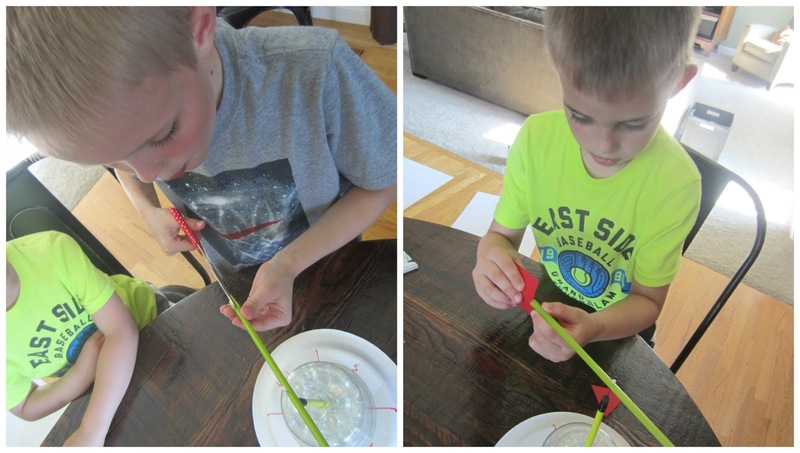 Pierce the center of the drinking straw with the stick pin. Put the pin into the eraser. Your straw should spin freely. Make small slits with scissors in the ends of the drinking straw. Cut a triangle and square shape from your heavyweight paper. Insert each into the slits on either end of the drinking straw. Take the weather vane outside. 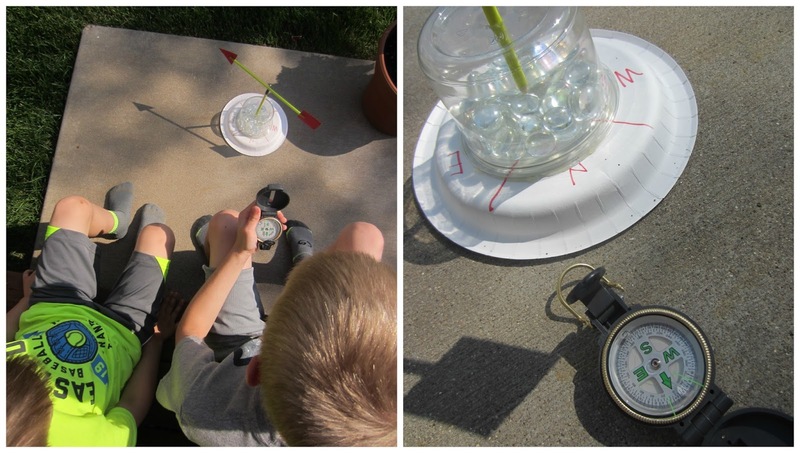 Use a compass to make sure your cardinal directions are aligned properly. Watch as the straw spins and the triangle shows you the direction the wind is blowing from. We read two books as part of this activity. They helped explain the impact the wind has on our weather, instruments to measure wind speed, and various activities (flying kites, wind surfing, etc.). I asked my sons why someone would need to understand wind direction and speed. Our oldest came up with lots of good answers, but his little brother (5 years old) wasn't sure. I asked him to punch the air. Then he made a fist and I put my hand around it. I told him to push. My hand provided resistance. "What if your fist was an airplane and my hand was the wind? Would it be harder to fly an airplane in the wind? Would you need to use more fuel?" This was a simple hands-on way for him to comprehend the invisible force of wind! 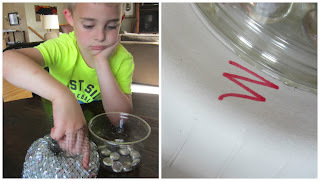 This activity was modified from education.com.